How do laboratory animals fit into our cultural mapping of the relations between animals, spaces, and ethical care? Numbers can be a contentious issue in animal research. The Home Office reports statistics of laboratory animal procedures in Great Britain every year. These figures are then the focus of comment across the community, pointing out trends, opening up issues in measurement, and identifying opportunities for improvement. These commentaries can also introduce comparisons to the numbers of animals killed in other sectors, including the meat industry, road kill, and hunting by domestic animals. 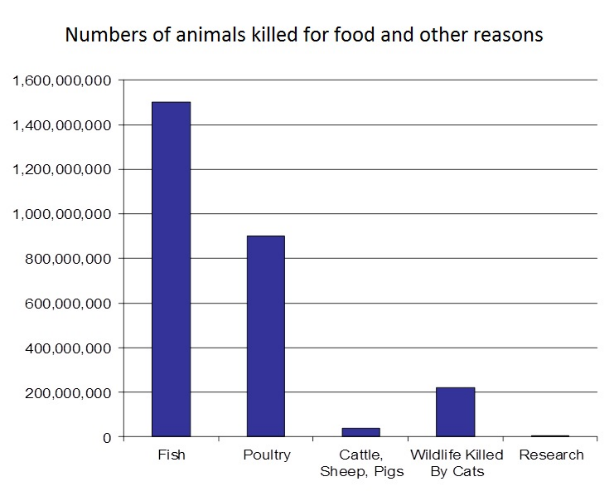 The argument seems to go that the number of animals killed for meat or by cats vastly exceeds those used in laboratory animal research. And since meat-eating and pet-keeping still enjoy wide support, so too should the use of animals in research. I want to probe this argument a little further. My sense is these comparative figures do provide an empirical context for the scale of the use of animals in research, but they do not address the ethical questions of laboratory animal care. And used carelessly, such comparisons have the potential to undermine communication about the increasing focus on cultures of care in animal research. Hal Herzog recently wrote an accessible book pulling together instances of our contradictory ethical positions towards animal use across pets, pests, protein, and research protocols. I want to give these arguments a geographical twist to explore how I think this might play out in laboratory animal research. This is somewhat speculative, but I did have the opportunity to explore these issues with students on the Geographies of Life module at the University of Exeter, who confirmed many of these points. I welcome any comments via email. What we know from the social scientific literature on attitudes to animals is that people do not consider ethics across different species and uses of animals in an abstract way. They do so in ways that are deeply dependent on cultural practices and spatial contexts. Attitudes to animals often vary according to the imagined spaces in which we place animals. This is a key focus of the growing interest in animal geographies. Broadly, this argues we have different culturally accepted ways of thinking about the ethics of animal care that differ across the spaces of wilderness, countryside, city, and the home. In the UK, we tend to judge wild animal lives according to the expectation that they have freedom. This includes the freedom to self-select mates, to find food, to suffer illness, even to starve to death. We look to these animals for cultural solace, but find it acceptable to shoot them if control is needed. We expect farm animals to be subject to stewardship: they are housed, fed, and medically treated, according to government regulation and economic cost. For many, their culturally-normalised end is to be eaten. Pets are now often extended the ethical responsibilities we offer to kin and companions. They may be invited to share homes, food, even beds. They are treated at a general practice and their loss to the household will be mourned when they die. These spatial categories, and the telos attributed to the species within them, are not fixed. They vary culturally (for example, in terms of which animals are considered edible) and they have changed over time (for example, in the changing patterns of pet keeping). However, the endurance of these culturally-accepted categories can be seen through what happens when animals and practices transgress them. We don’t want wild creatures in our homes, sometimes even our cities (as evidenced in some people’s hostility to urban foxes), and will countenance modes of killing unacceptable elsewhere to exclude them. We are more upset as a society about the numbers of farm animals killed in disease control (like Food and Mouth Disease or bovine TB) than killed for food, even if the farmer is compensated, as the animal's life is seen as wasted. We don’t accept cattle or horses being left to starve, which emerges as a tension around their use in rewilding practices. And we would not accept people shooting their pets at the end of life, even if this is argued as a humane way to control foxes. Proposed changes to these culturally-accepted ethical positions are often felt as morally wrong, they are strongly resisted, and can cause conflict. The question then is how do laboratory animals fit into this imaginative mapping of animals, spaces, and care? This was historically a complex use of animals for which to establish a proper place, ethically and culturally. You can trace this difficulty in the history of controversies around the origin of animals used in laboratory research practices. These focused extensively on the source of animals, including conflicts over the use of shelter animals in the USA, and changes to laws on animal supply in the UK. The contemporary cultural accommodation has been to place laboratory animals imaginatively in contexts that speak to discourses of clinical care. There is increasingly a shared vocabulary across human and animal care. The term a ‘culture of care’ emerged in social care before being adopted in animal care. There are increasingly common practices across human and animal procedures, including the use of aseptic surgery, analgesia, and management of stress. This leads to a similar aesthetic across these spaces too, with hospital scrubs, face masks, gloves, wards, and corridors featuring strongly in both. We are culturally learning to place laboratory animals within these clinical landscapes of care. In part this has been a deliberate shift, facilitated by those seeking to update visual representations of laboratory research, and in part a response to growing practices of translational research. These more human ‘clinical conditions’ may not necessarily be the best from animal welfare perspectives, but they set an expectation of what good care looks like. We read across our own experiences of hospitals to expect care that is dignified, respectful, and attentive. The arguments over laboratory animal care expand to use of loud radios in the laboratory. Leaving water and food out of reach for either humans or animals is seen as the most fundamentally care-less act. Introducing a meat-eating comparison into this context is culturally confusing, rolling back on an emerging cultural way of ‘placing’ the ethics of animal research in clinical care and mixing it with ethical practices from another cultural domain. Care means different things in the spaces of farming and the clinic, with different roles allocated to different professionals, and the animals have different imagined ends. Mixing ethical arguments around laboratory animals and meat production can lead to feeling that someone is getting it wrong; crossing cultural boundaries that make people feel uncomfortable and confused. These issues came up in earlier work on xenotransplantation. The cultural arguments used to justify xenotransplantation tended to point in two different directions. First, they stressed the care given to pigs and the clean hospital-like conditions they were kept in, emphasising the equivalence between human and animal patients, to help people feel more comfortable about accepting an organ from this source. Second, they also talked about the use of these animals as a continuation of their role in culturally-accepted modes of meat production. The complex mix of the two gave rise to the spectre of cannibalism in some people’s imagination. Would you want something vital in your body that others would potentially eat? The students I introduced at the start talked over these issues with particular reference to the graph below. They are postgraduate students, not the general public, but they are not experts in this area either and their responses were instructive. They were struck by the large figure under fish compared to other categories, but the lack of information meant they could not place the argument being made here. They wanted to know where all these fish being killed were and why did they not know if they were being used for food, in fishing, for fertilizer, or for feed? This mattered a lot to them. They did find the scalar comparison interesting, but they did not feel this could be used as an ethical argument. The ethical case for them hinged on knowing who was acting with responsibility and accountability for the animals in each context of care. A comparison with cats does not reassure in this case. These are mainly young people and the degradation of both marine and terrestrial environments is a significant source of anxiety for them. The high numbers of animals used in other sectors did not reassure; rather they ended up more concerned about whether proper responsibility was being taken than before. They were sceptical about the motives of these comparisons to argue an ethical point. I asked for some feedback. One person wrote later to me saying: “Amazing how people can believe this is an argument in defence of using animals in research. For people inclined to disagree, presenting these kinds of comparisons will just give them another thing to be upset about. It seems a poor strategy based on a poor understanding of human nature”. There are good reasons why advocates of either laboratory animal research or animal protection might want cultural arguments about animal ethics to be less contradictory, but such complexities cannot be argued or wished away. Human nature is not simply capricious; these views are deeply embedded in different human cultures, which continue to matter to moral thinking when people and animal are bought into new relations. Care means different things in the spaces of farming and the clinic, with different roles allocated to different professionals, and the animals have different imagined ends. Mixing ethical arguments around laboratory animals and meat production can lead to feeling that someone is getting it wrong; crossing cultural boundaries that make people feel uncomfortable and confused.